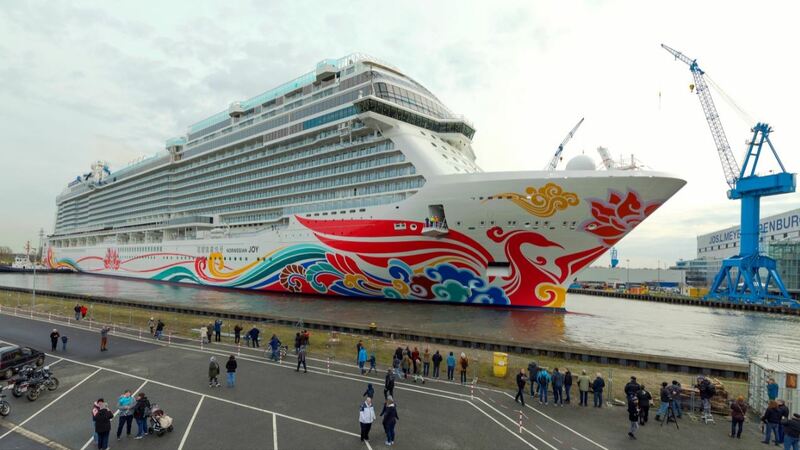 Norwegian Joy, Norwegian Cruise Line’s first cruise ship custom designed for China, was floated out at the dockyard on Saturday, March 4. 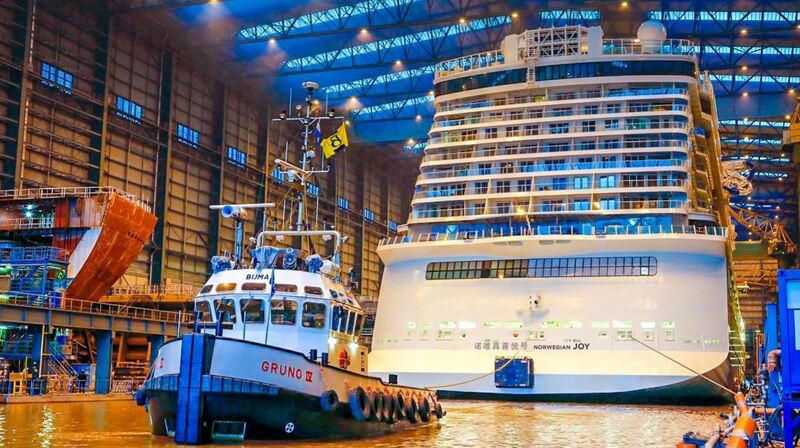 Currently being built at Meyer Werft in Germany, Norwegian Joy is Norwegian Cruise Line’s first purpose-built ship customized for China. Having been under construction since September 2015, the float out of the 168,800-ton ship represents a major milestone in the vessel’s construction. With the ship being well on her way to completion, she will now move into the final phase of construction with delivery taking place on April 27, 2017. Beginning early Saturday morning, the 3,850 passenger vessel, with her distinctive hull artwork designed by Chinese artist Tan Ping, departed building dock II. Norwegian Joy is the second ship in the line’s Breakaway Plus Class. Arriving in Summer 2017 the ship will home port in Shanghai and Beijing (Tianjin). “We are thrilled that Norwegian Joy is now one step closer to delivery and one step closer to delivering on our promise to create a First Class at Sea experience for our Chinese guests,” said David J. Herrera, Norwegian Cruise Line Holdings China President. Designed to provide First Class at Sea experiences with onboard amenities that cater to the unique vacation desires of Chinese guests, Norwegian Joy will provide a multitude of VIP accommodations including The Haven by Norwegian, the line’s exclusive, ship-within-a-ship suite luxury complex. The private enclave will include an all-new Observation Deck that features 180 degree views, and a Concierge level, an all-new accommodations category which will provide a VIP experience and feature larger balcony staterooms. Further accommodation offerings will include staterooms designed specifically for families and a multitude of connecting staterooms, for extended families traveling together, as well as a wide array of mini-suite, balcony, ocean view and interior staterooms, many with virtual balconies. 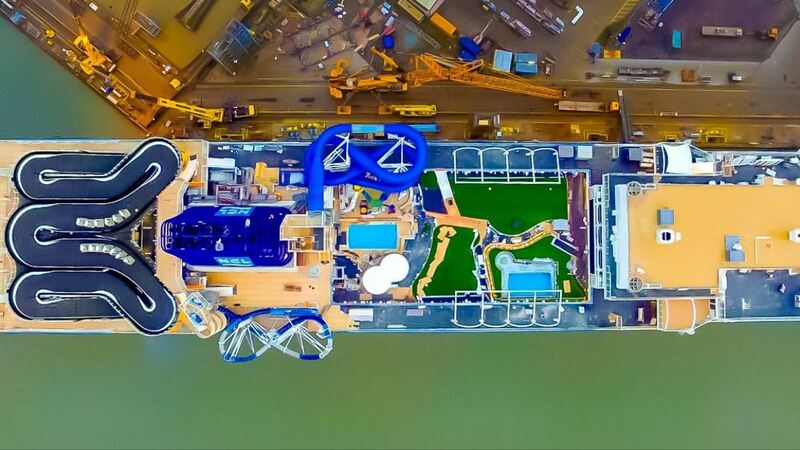 Norwegian Joy will offer engaging and innovative activities including a thrilling first-ever two-level competitive racetrack at sea, an open-air laser tag course, thrilling simulator rides and interactive video walls at the Galaxy Pavilion as well as hover craft bumper cars. With no less than 28 different food and beverage outlets, Norwegian Joy promises to become a true foodlovers paradise. Joy will offer everything from Chinese hot pot to sophisticated French haute cuisine, the freshest Japanese sushi to the highest quality American steaks and burgers. For a closer look at the culinary offerings on board Norwegian Joy visit the culinary offerings on board Norwegian Joy. To find out more on Norwegian’s east meets west experience, visit our introduction to Norwegian Joy. Pictures courtesy of Norwegian Cruise Line and Meyer Werft. Next Going once, going twice… another cruise booked!